(Trent Nelson | The Salt Lake Tribune) Brigham Young Cougars guard TJ Haws (30) as BYU hosts Northwestern State, NCAA basketball at the Marriott Center in Provo on Tuesday Nov. 13, 2018. Provo • As BYU’s season plods through January, it is becoming more evident that this is not one of coach Dave Rose’s better teams. In fact, it might be one of the worst. The Cougars fell to 12-9 overall, 4-2 in West Coast Conference play, after getting thumped 82-63 by San Francisco on Saturday night and wouldn’t even make the National Invitation Tournament (NIT) if the season ended today. Seven of the nine losses have been by nine points or more and three have been by 19 points or more. 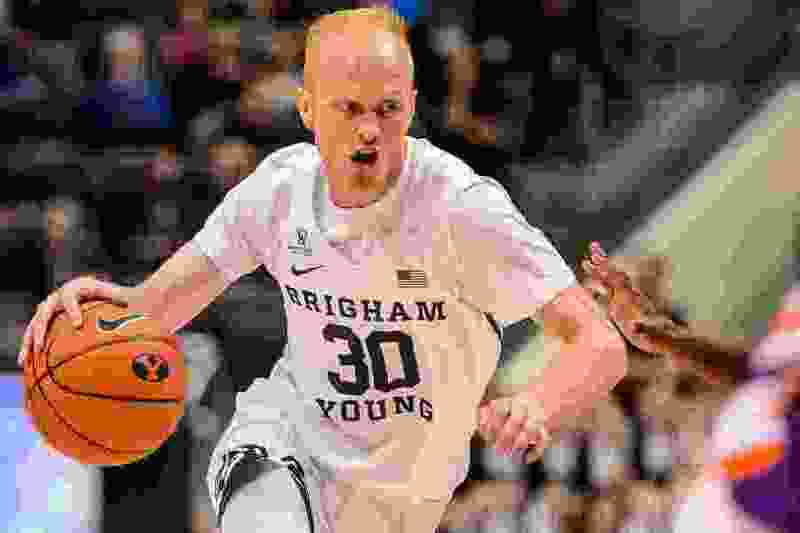 It is certainly not the way BYU fans expected this season to go, especially back in the fall of 2016 when the so-called “Lone Peak Three” of Lone Peak High graduates Eric Mika, Nick Emery and TJ Haws were reunited in Provo. Back then Mika was a sophomore returned missionary and Emery and Haws were freshmen who did their church service before enrolling at BYU. The trio led Lone Peak to a mythical high school national championship in the 2012-13 season and some were predicting they would lead BYU to at least a couple of deep NCAA tournament runs. “Our patience has paid off,” Rose said prior to the 2016-17 season. BYU fans know all too well how it fell apart. Mika left the program after two seasons — sandwiched around a church mission to Italy — for a professional career overseas and Emery missed the entire 2017-18 season and the first nine games of this season for personal reasons and NCAA sanctions related to accepting impermissible benefits from four BYU boosters. Only the 6-foot-4 Haws, now a junior who made his 90th-straight college start in the loss at USF, is living up to expectations. The only Cougar having a better season is junior Yoeli Childs, a West Coast Conference Player of the Year candidate who is averaging 22.3 points and 9.6 rebounds per game. Childs is 15th in the nation in scoring and 26th in rebounding. Haws scored a career-high 34 points in BYU’s 87-76 win over Pepperdine last Thursday and is averaging 17.7 points, 5.1 assists and 4.0 rebounds per game. “I feel like I’ve been preparing to do that since I was a kid. You know, early mornings at the church, late nights at the church, shooting in high school gyms. I have been shooting those shots my whole life,” Haws said after hitting a big 3-pointer in the final minutes to put away Santa Clara on Jan. 12. Haws will probably never catch his brother, Tyler, who is BYU’s all-time leading scorer with 2,720 points. But in the next five or six games he will likely catch his father, Marty Haws, who is 23rd on the list with 1,337 points from 1986 to ’90. TJ Haws is 29th with 1,251, having recently passed the likes of Jackson Emery (1,235) and Doug Richards (1,218). “TJ is making big plays and showing a lot of confidence in his guys. That’s a good thing, too,” Rose said after Haws tied a career high with eight assists against Pepperdine. He has led BYU in assists in all but three games this season and is shooting 48.3 percent from the field and 82.5 percent from the free-throw line, both career highs. As for Nick Emery, the Cougars are still waiting for the junior to regain the form he showed as a freshman when he averaged 16.3 points. He averaged 13.1 points as a sophomore, but this season that has dropped to just 5.0 points in 12 games, while getting around 18 minutes a game. Rose said Emery, whose defense has improved from his first two seasons in Provo, has brought a positive attitude to the team.